John Casimir, Prince of Anhalt-Dessau: Speech is more than eloquence. In stores soon. We’ve all seen them. Forward this mail or die. Forward to 50 friends and fall in love tomorrow. Fill out these 7,000 questions and forward to all your friends. Well I stumbled across this one on Facebook, and couldn’t stop myself as soon as I hit the Wikipedia entry. 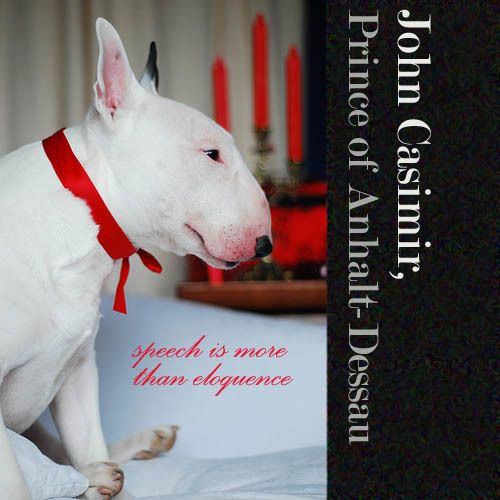 Ladies and gentleman, I give you the latest album from John Casimir, Prince of Anhalt-Dessau. Speech is more than eloquence.